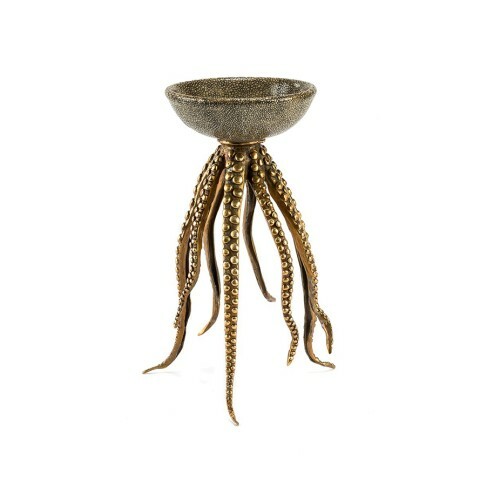 No matter how beautiful your home accessories collection may be, if its members aren’t given a home that does them justice then all magic is lost. Finding that perfect place on a shelf display is an effective way to showcase your home accents in all their glory and ensure they bring the utmost impact to your space. We caught up with the designer to uncover the tricks and techniques she uses to achieve high-impact styling every time. Take inspiration from her style notes alongside our round-up of stunning shelf displays. How do you approach styling shelves? I particularly enjoy putting together collections of vases and accessories of the same style but different heights and textures. This always has a great impact. Candles are also always an integral feature of my designs. What are your favourite objects to use? Very simple items will always result in something incredibly stylish. I love moss balls, flowers and coral sculptures to create an organic feel. Old books and parchment paper wrapped in string, as well as photographs and pieces you’ve picked up along the way can bring a personal touch. I also love to add glass pieces to my shelves. Do certain sized accessories work better than others? This all depends on the composition of your shelves and the height of the pieces in your space. 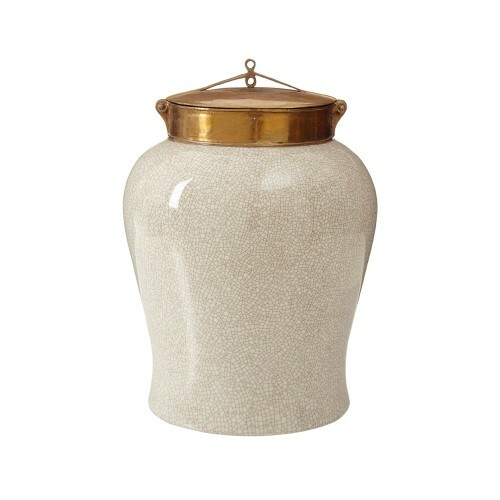 I love vases of all shapes, sizes and textures. I tend to add a much taller piece to the end of my shelves as this balances everything out. Can you recommend any materials that make a particular impact? I love reflective pieces on shelves as this allows you to play with light. Using glass and silver can create a very vibrant shelf design. I am a very spiritual person and you’ll often see crystals on my shelves. As well as being aesthetically pleasing, placing crystals in strategic places around your home can have beneficial soothing and healing effects. You’re a fan of arranging accessories in threes. Is this a rule you apply when styling shelves? If you see something you love, buy a collection of them – a group of ornaments can have more impact than one item. Finally, do you have any other need-to-know secrets? It is important to take time to consider very carefully how you are going to display your objects on your shelf or it will never look right. Always consider the size and height of the furniture within the room beforehand and make sure to remember that you are after balance rather than symmetry. In addition, remember that you must leave some space between your pieces. A shelf is often spoiled by too much treasure clutter, so be firm with yourself and remember – less is more. Now we’ve got the basics covered, let this selection of standout shelving scenes help you decide which style route to take. The angular tiers of this metallic shelving unit call to be decorated with super-luxe accessories – and the experts at London-based interior design firm Lawson Robb do just that. 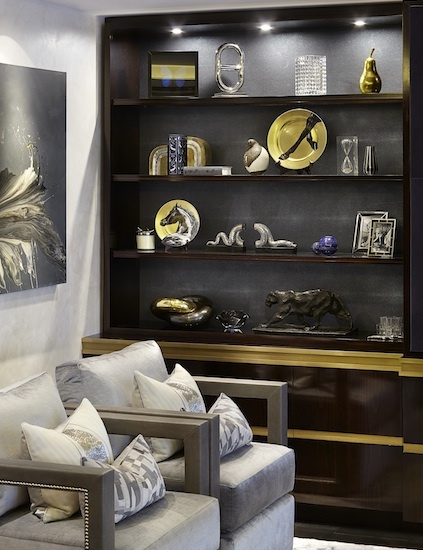 The stunning display, which resides in an exceptional Holland Park living room, is a beautiful balancing act of bookends, trinket boxes, coloured vases and fashion-focused books. What’s the key to this look’s success? Neither side outshines the other. The display looks incredible as whole, with the presence of exquisite blue tones weighed evenly across the left and right sides. The high point of the look has to be the agate sculptures that take pride of place at the heart of the display. Follow its lead and let your most striking accessory take centre stage. This image from a Belgravia townhouse apartment demonstrates that an accessories overload can be executed with taste and class. The team at Helen Green Design take full advantage of the open shelving unit to create the ultimate platform for home accents. The display’s victory lies in the variety of objets used, giving viewers a museum-like experience that enables them to discover something different and beautiful within each compartment. 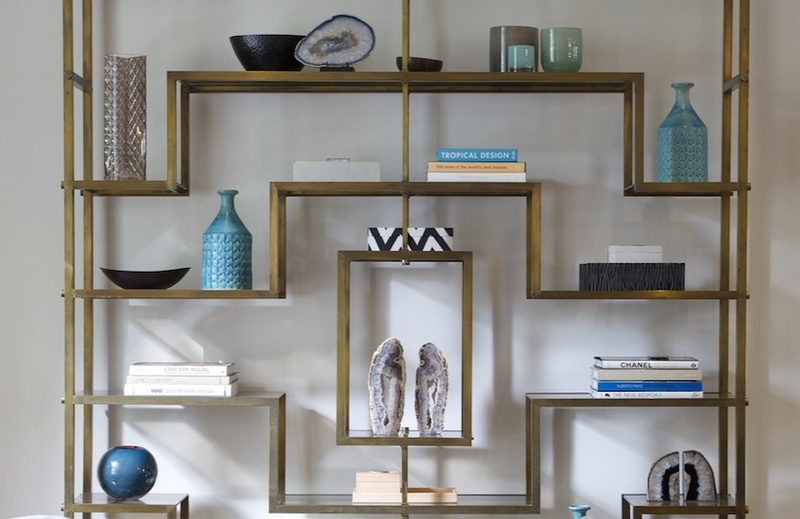 From the stacks of books and leather boxes to the playful jack sculptures and natural agate bookends, see how the accessories are chosen in dark, light and metallic shades to complement and contrast the rich wood shelving. Thinking of your shelves as an opportunity to reveal something about your character is a great way to create an individual space. The shelving in this Chelsea Arts and Crafts style house – packed with the homeowner’s treasured books, photo frames and accents -adds immense interest to this neutral living room by Tessuto Interiors. Playing with numbers, the display presents accessories in pairs and triplets, and lets statement pieces stand solo. Take inspiration from the hidden cupboards behind the panelling in this room if you have more accessories than you know what to do with. Concealed storage solutions are perfect for storing additional accessories, enabling you to put new additions on display with ease when you crave a change. As a clear space equals a clear mind, this home office keeps its shelving display sleek and tidy to let smart thinking and creativity flow. The space, which is designed by luxury London-based interior designer Louise Bradley, adopts a selective approach to accessories, only allowing neutral pieces to make an appearance on some of the shelves. Materials play an integral part in the display and show themselves in the form of exquisitely textured glass designs alongside marble discs on metal stands. This display is then taken to the next level with considered lighting. 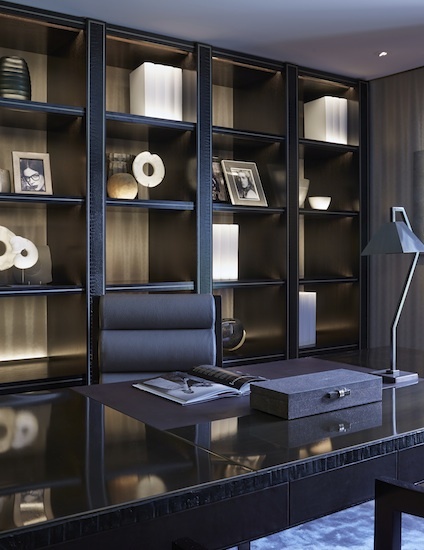 Concealed linear diffused strip lighting is carefully placed in the dark stained timber unit to throw illumination in all the rights places and show off the accessories in the finest light. This home office keeps its shelving display sleek and tidy to let smart thinking and creativity flow. 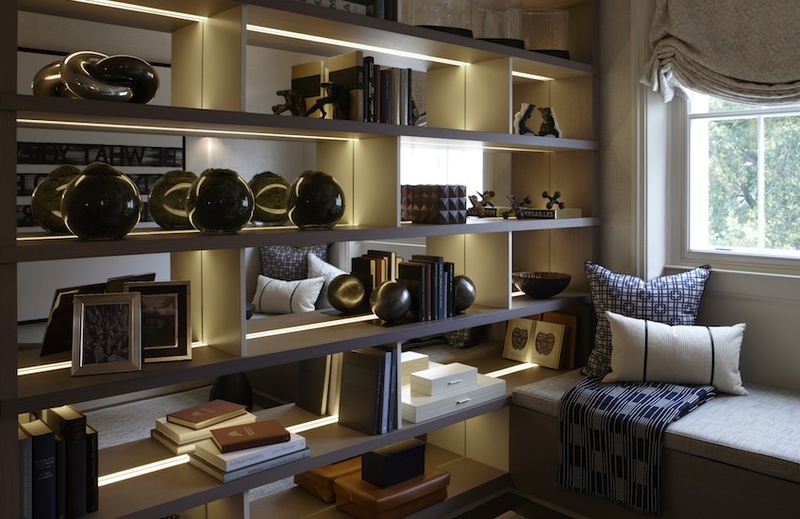 Katharine Pooley encapsulates modern luxury in this shelving display. The look, which occupies a plush London living room, is steeped with character thanks to the variety of objets that rest upon each shelf. 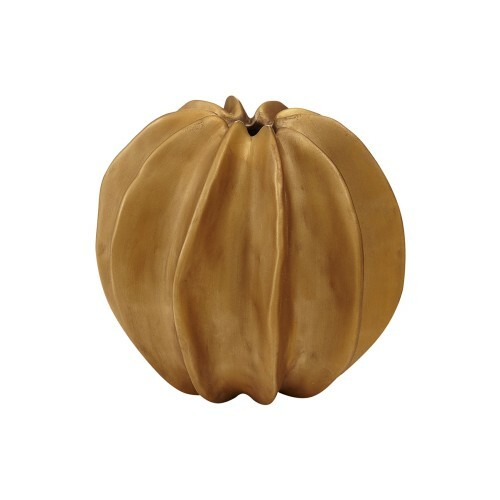 The natural world is championed with an impressive jaguar sculpture, a pristine pear objet and stunning plates painted with a horse’s head and galloping feet. Rich gold and silver tones combine to provide the perfect contrast to the deep wood unit whilst crystal clear glassware invites the spotlights to bounce beautifully off their surface. To complete the look, blue sculptures are left to add a tasteful hint of bold colour here and there. The look is steeped with character thanks to the variety of objets that rest upon each shelf. This next shot is proof that a tricky shaped shelving area doesn’t have to hinder a stylish display. Whilst it’s tempting to ignore awkward corners, they can bring a large dose of character to room when styled effectively. In this instance, the Helen Green Design team embrace a triangular space, transforming it from an difficult nook to an attractive room feature. 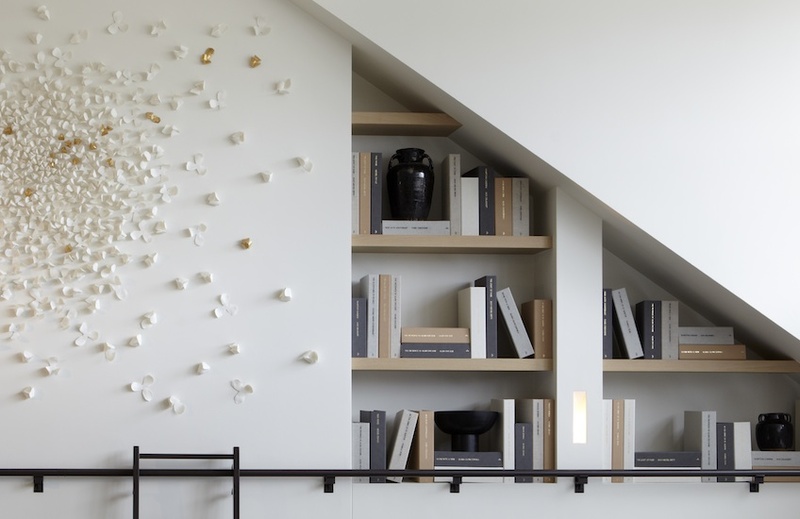 The clean, modern shelving is filled solely with books in light neutral hues to match the room’s pared-back palette. Books are artfully tilted and stacked horizontally and vertically to create mini pedestals for the black ceramic vases. 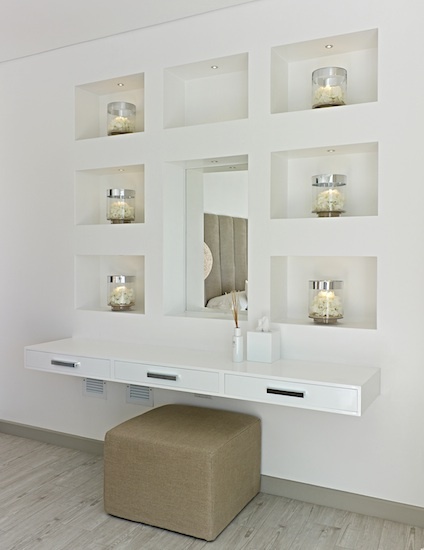 Intelligently styled shelving is an incredible way to fast-forward a clean white space into something really special. Despite working simple black and white hues, the accessories in this scene are extra-high on impact thanks to their thoughtful positioning. Balance is synonymous with Deborah Oppenheimer’s work, and the designer doesn’t stray from her habits in this home office. Accents are stationed in a symmetrical arrangement to create a calm, levelled feel and invite the eye to focus on and appreciate each shelf. Not short of smart techniques, the designer uses beautiful black and white images of book spines as an innovative way to evoke the idea that the shelves feature stacks of books.